Gamification involves taking something (such as a task) and turning into a game. This involves giving it a clear end goal, assigning it a difficulty level, and setting rewards for completion or penalties for failure. It creates a structure that helps with analyzing the problem, strategizing solutions, and implementing a plan. It encourages us to look at tasks in new ways, figure out ways to do them better, and feel more accomplished when we complete them. Look at driving as an example. For better or worse, many people treat driving like a game, and if we break it down we can see why. In reality driving is much more complex than this, but there are clear goals that manifest themselves by the way people drive. The guy weaving through rush hour traffic at 60 mph clearly thinks his reward is more valuable than his own safety or the safety of those around him. Whether this is true or not is completely subjective, but the point is that it’s important to him. He gains the most satisfaction from reaching his destination quickly, and treating it like a game only helps him achieve this goal more efficiently. Driving is just one example. People have gamified all aspects of life, from doing the dishes to raising children. Gamification is about taking advantage of our innate desire for reward and applying it to things we would otherwise consider mundane. 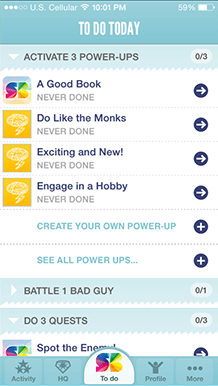 I first learned about gamification by browsing to-do apps in the Play Store. 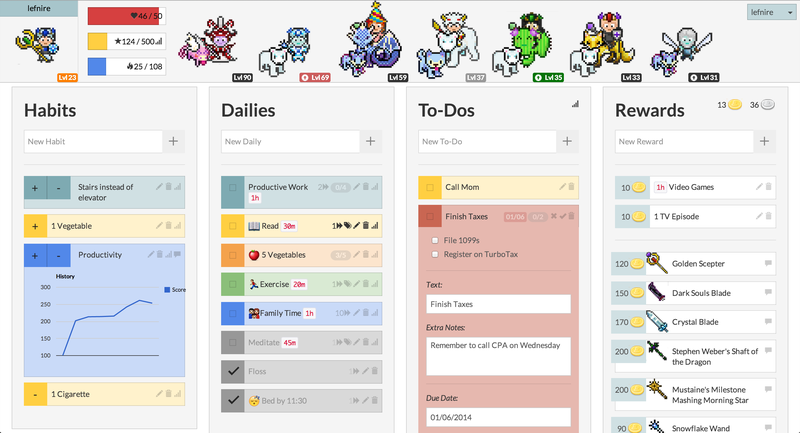 These apps essentially take a normal to-do list and wrap it in various game-like features. Most of these apps follow the role-playing game (RPG) formula where completing tasks grants you experience, you can “level up”, and in some cases you can even earn virtual currency and “buy” rewards. Some of these apps dive even further into the game aspect by letting you create a virtual avatar, choose from various specialties or classes, form parties with other players, fight bosses, and buy weapons and armor. My only problem with these apps is that they focus more on the tool (the app itself) than the goal (motivating yourself to be more successful). That being said, here are some of the apps I tried and those that I found to be the most useful. Habitica is a vast multiplayer game where your actions directly drive your progress. You start off by creating a character and customizing his/her appearance. As you complete tasks, your character gains experience and will level up over time. Gaining multiple levels lets you unlock classes and even gain pets. And like any true RPG, you can team up with other players and battle various monsters using nothing but your ability to complete tasks. Finishing tasks lowers the monster’s health, while failing to finish your tasks lowers your own health and the health of your party members. Habitica takes an incredibly novel approach to motivational engagement. It’s free, it’s intricate, it’s web-based, and the social aspect is a great source of encouragement. The only problem is that it treads a bit too far into game territory and can take much of the focus away from the tasks themselves. In other words, completing tasks simply helps you achieve goals in Habitica, when really it should be the other way around. However, Habitica is open source, and the developers actively encourage users to contribute ideas and patches to improve the game. You can learn more about Habitica on Habitica.com. SuperBetter is all about self-improvement and self-development. It was designed from the ground up as a motivational tool to help people achieve long-term goals such as building habits, learning new skills, dealing with illness, or helping others. It does this by generating action items based on the type of long-term goal you provide it: for instance, if you’re suffering from depression, SuperBetter assigns you tasks that encourage you to appreciate your surroundings, move more frequently, etc. Like Habitica, SuperBetter also presents enemies in the form of negative behaviors or emotions. You fight these enemies in SuperBetter by “fighting” them in real-life, which I find to be a fantastic way of cementing virtual actions in reality. Since SuperBetter is mostly about helping you achieve long-term goals, it doesn’t work as well as a to-do list or task tracker. Most of your tasks will come in the form of Power Packs, which are curated bundles of tasks focused on one or more specific goals. The benefit of this is that it requires no set up on your end other than specifying your long-term goals. However, it does limit you somewhat in how you can approach those goals. SuperBetter is available as an app or online at SuperBetter.com. LifeRPG takes a much more hands-on approach than either Habitica or SuperBetter. It essentially provides a blank template and asks you to define your own tasks, set your own challenges, and choose your own rewards. LifeRPG uses many traditional role-playing mechanics such as experience, levels, tasks (or missions), rewards, and even skills. Completing missions not only contributes to your experience, but also contributes towards leveling certain skills. You can see how your skills have changed over time and how strong certain skills are compared to others. For example, I want to become a better chef, so one of my ongoing missions is to cook a complete meal from scratch. Each time I complete this mission, my cooking skill increases and I award myself a certain number of points, which I can then use to “buy” a treat for myself such as a dessert or a glass of beer. Again, it’s all completely virtual, but it’s directly linked to real rewards. I’m simply using my brain to motivate itself. The benefit of LifeRPG is that it’s extremely flexible. It simply provides the interface, and you provide the content. This can be daunting at first, especially since it comes with little to no explanation of what each component is and how it affects other components. But once you understand how it works, it’s extremely satisfying to see how completing one mission can make you better suited to handling another mission. 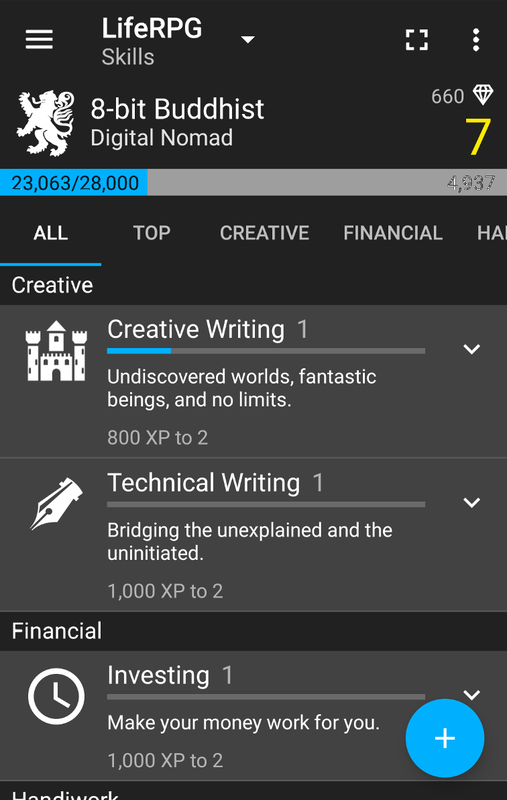 LifeRPG is only available as an Android app. As of this writing, I’m currently using LifeRPG and it’s been extremely effective. Even regular tasks like emptying the trash or doing the laundry are incredibly satisfying to complete. I realize that this isn’t a permanent solution, but as a motivational tool it’s certainly helped me appreciate how much I accomplish each and every day. In the future, I may write a post detailing my LifeRPG setup. In the meantime, I hope you find these tools useful in making your own life more productive.